The role of video for business is changing, fast. To keep up, brands need to start producing multiple videos per week, in a way that is consistent, authentic, and affordable. The only way to achieve this (in our humble opinion) is for brands to harness the power of insourcing and bring at least some of their video production in-house. 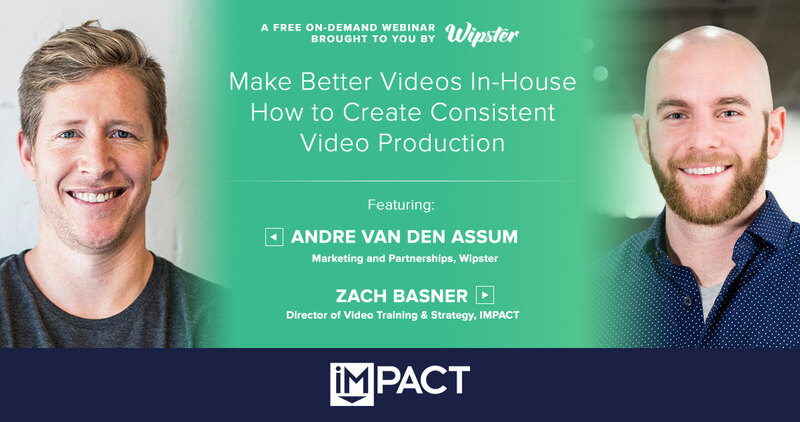 In this exclusive webinar, you will learn the steps you need to take in order to insource video production and ensure you make great videos from the outset that are high quality and drive outcomes. Check or the recording to learn a proven framework for creating a video strategy from scratch and why insourcing is the most effective way for your brand to produce quality videos at scale. As Director of Video Training and Strategy at IMPACT, Zach helps teams improve their sales and marketing efforts by creating influential and effective video strategies. He teaches them how to create high-quality video content in-house and empowers them by developing professional production and on-screen techniques. Zach has hired and trained more than 40 videographers, reviewed and edited hundreds of videos from across the globe, and shot and directed hundreds of his own. Andre heads up strategic marketing partnerships at Wipster, the leading video review and collaboration platform for brands. He’s worked with innovative companies like Shimano, Xero, and Sephora, helping them fold video into their content marketing strategy and develop workflows that let them do more with less. He’s passionate about helping customers succeed and the vital role that day-to-day process plays in realizing larger marketing goals.